This week, Adele Bruno had a lovely string for her challenge number 284. It’s a String Thing 284, with a nod to Spring, brought 3 familiar tangles. Mumsy, by CZT, Sandy Steen Bartholomew, Jasmin by Simone Bischoff, CZT and Crescent Moon by Rick Roberts and Maria Thomas. Here’s my tile! Also this week, another in my March Celtic Knot Series. This week I’m showing you how to create this border pattern with corners! If you know the pattern Huggins, then you can draw this pretty knot! 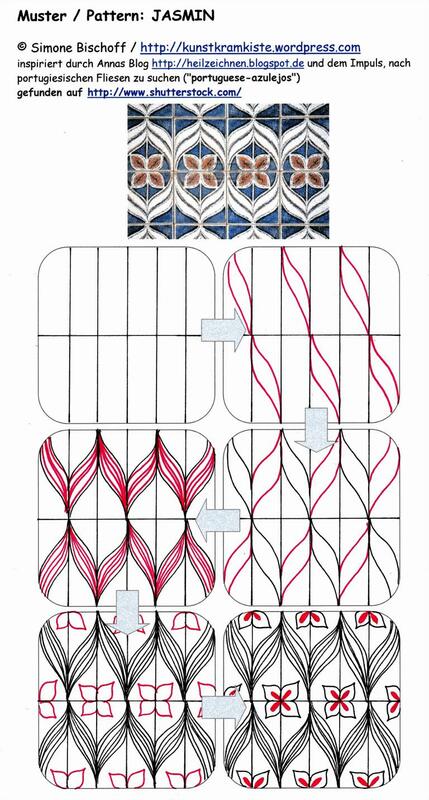 Did you all get your project pack 05 from Zentangle.com? The PP05 videos will start April 12th and we’ll be following the fun! If you don’t get it it’s ok! Watch my reveal video and see what you’ll need to follow along! Thank you for the great tutorial Cyndee, you made that complicated looking knot doable!! Thank you Jan! Once I figured it out I was excited how easy it was!